Produced by Per Solberg, formerly of the Laboratory Animal Unit, National Institute of Public Health, Oslo. Click on the thumbnail images to download a large version of each image. Click on your browser's "Back" button to return to this page after viewing the large images. At this stage of the oestrous cycle there is little material to be collected, and it consists mainly of traces of secretory material with cellular debris. There are few intact cells to be found. Some parabasal and intermediary cells may be observed. 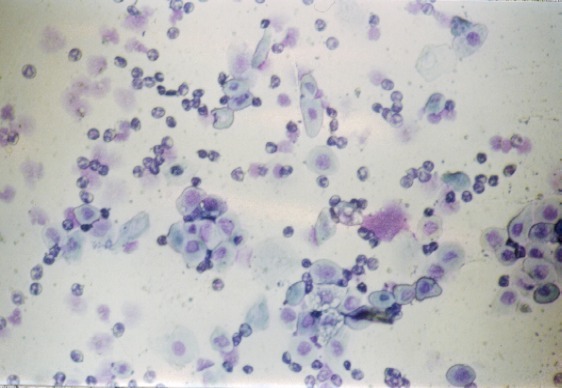 There are usually few leucocytes, if any, to be seen. There is considerably more mucus at this stage, often present as thick strands or discs. 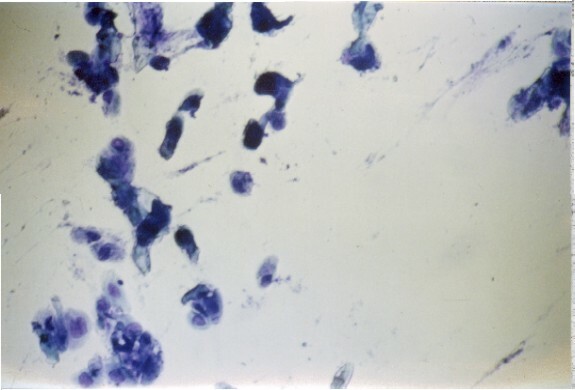 The histological picture is more complex and darker. Leucocytes are rarely seen in pro-oestrus. Most of the cells present are parabasal cells, often with an irregular or shrunken appearance, but intermediary cells may also be observed. 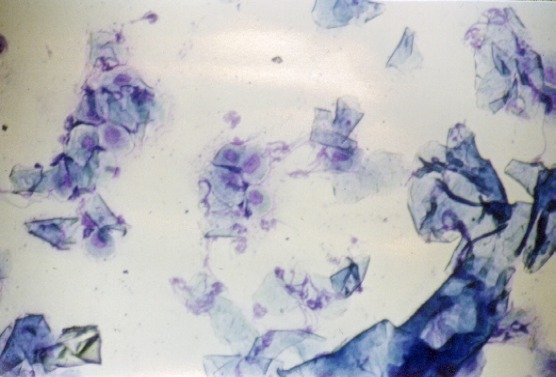 The smear becomes "cleaner", with less mucus. 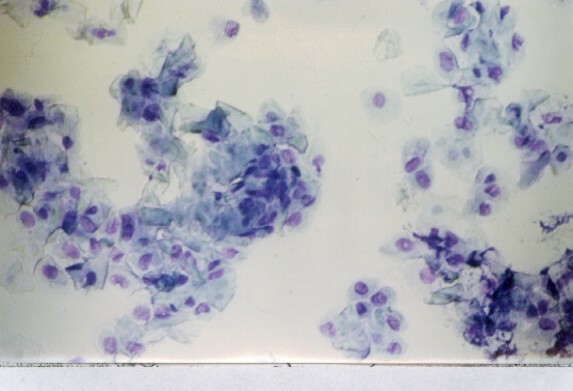 Parabasal cells appear more clearly, as do intermediary cells. 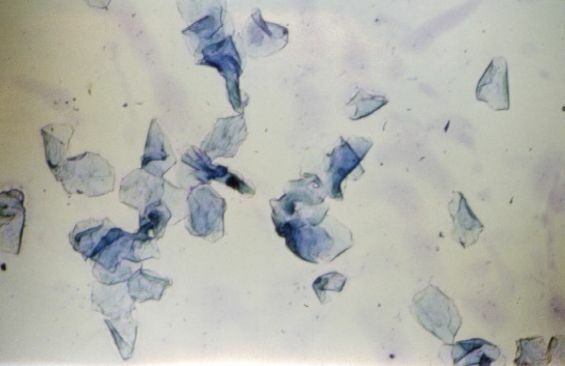 Cell debris can still be observed. 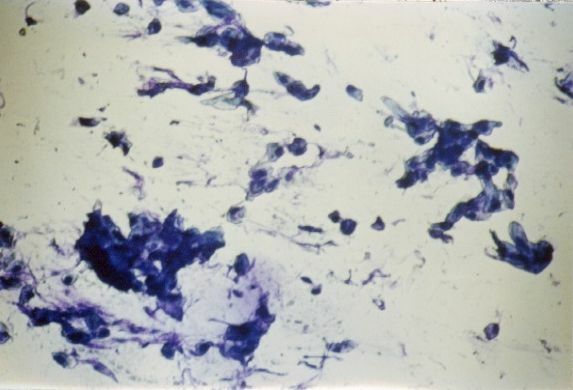 The smear is much lighter in colour and mucus is rarely seen. The cells are predominately intermediary cells, and parabasal cells are rare. 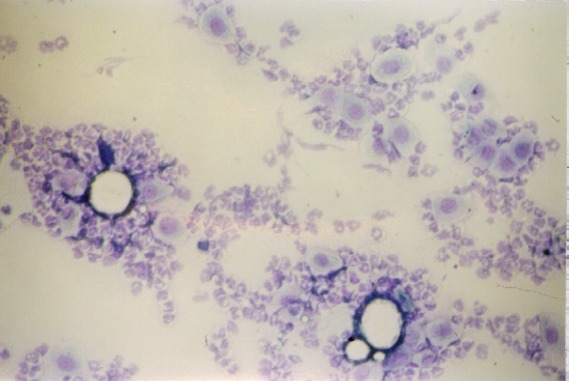 Lecocytes are hardly ever observed. 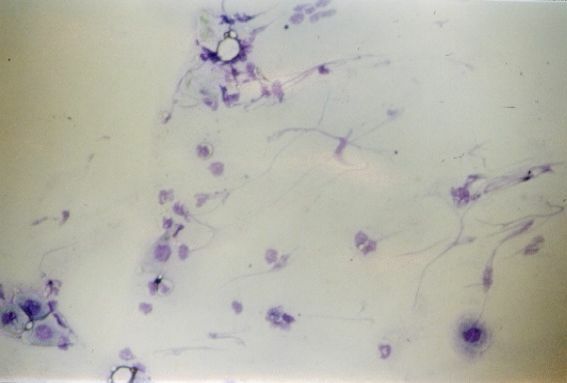 The smear is clear and dominated by cells. These consist of intermediary cells, superficial cells and anuclear (keratinised) cells. 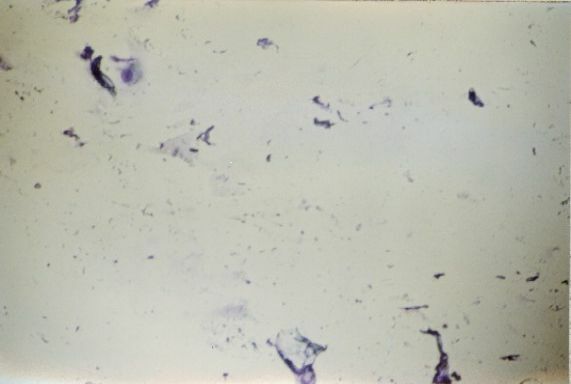 The smear consists nearly entirely of keratinised superficial cells that lie singly in early oestrus. They form groups as oestrus progresses and by the end of this stage of the cycle they can form large flakes. 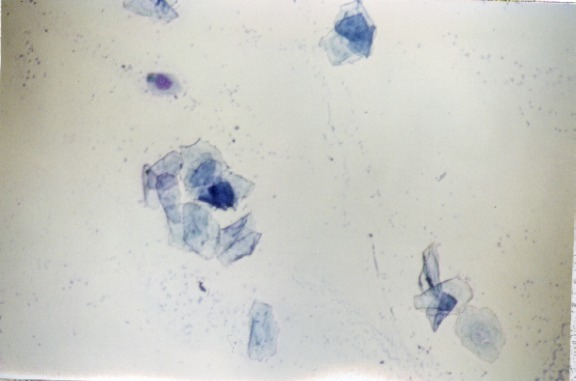 A few intermediary cells with intact nuclei may occasionally be observed. 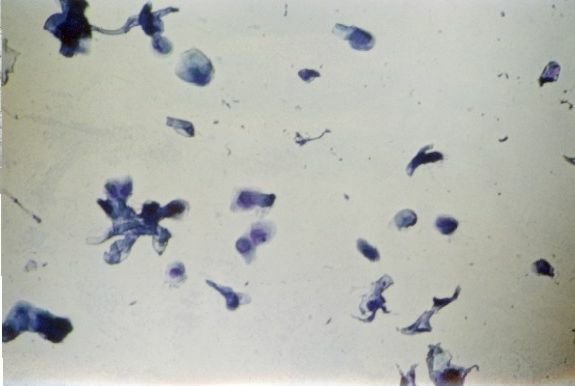 Although flakes of keratinised cells are still present, this stage is characterised by the presence of leucocytes and (to a lesser extent) intermediary cells. 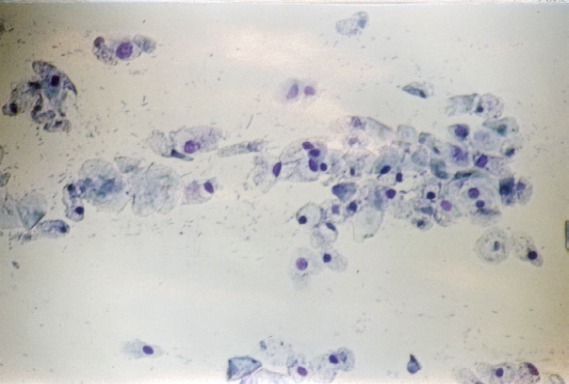 The picture at this stage of the cycle is dominated by leucocytes, often in large numbers, and intermediary cells. As this stage progresses, more intermediary cells begin to appear. These are often small and dark. Parabasal cells can also be seen. 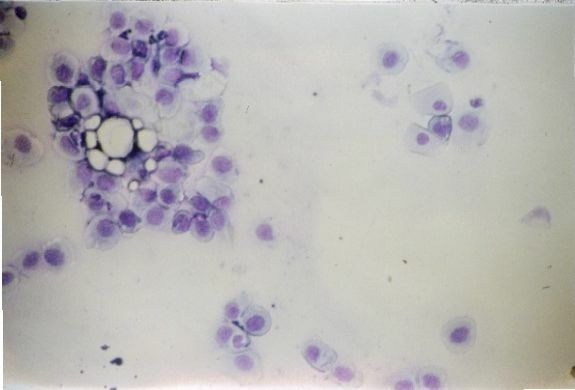 However, larger intermediary cells and leucocytes are also present. This stage is characterised by the reduction in cell numbers and the reappearance of mucus. often in thin strands. This picture shows a continuation of this process, as the mucus becomes progressively more apparent and cell numbers decline. The cellular picture at this stage resembles in many ways the transition from dioestrus to pro-oestrus, but the general picture is darker, the cells rarely appear intact and there is a lot of mucus and cellular debris. It is often at this stage that the rat's oestrous cycle may halt. This picture is characteristic for early oestrous development after a period of anoestrus. 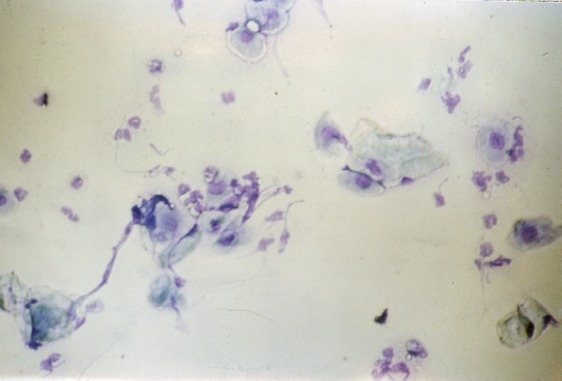 The vaginal smear may in some cases show fewer cells than in this picture.